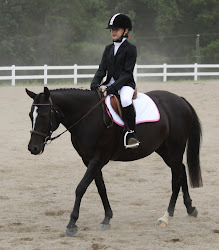 So, the horseshow was super - Barney was a star and exactly the horse I hoped he would be! I feel like we have run the course of "new" with great success these last couple of months, and he has been a gem in every situation - what a lucky girl I am to have found him! To recap, I have now ridden him in 40 mph winds, a huge thunderstorm that came out of nowhere, around the giant, very loud mulch truck with its long snaky hose shooting mulch all around the barn, and at our first horseshow together, where we were one of the first rides, so very few horses were around for company. We've now done vet, farrier, dentist, and saddle fitter with complete compliance and lots of patience (okay, we needed a little something for the dentist to get those hooks, but anyone would need to take the edge off before letting someone stick that giant thing in their mouth). We've loaded and unloaded like a champ, clipped and bathed with no issues, and he has been the rock solid citizen every amateur rider dreams of having. Can you tell I'm a happy girl? Oh, and I didn't even forget Rowdy's awards day at school today- a good week indeed! i forgot to list the day we rode with a neighbor apparently target shooting nearby - i was completely unnerved by the rapid fire - barney just looked around - STAR, i tell you!